Scott's Web Log: D-Feast Friday: "God, Do I Really Have to Blog About Food?" D-Feast Friday: "God, Do I Really Have to Blog About Food?" I'll be honest, I think there's already way too many books, articles and far too much unsolicited advice for people with diabetes (PWDs) about food already -- not all of it's even useful, but because there's plenty of lousy advice out there when it comes to diabetes (see here if you need convincing), why should the subject of food be any different? Because of this, I seldom cover the topic of food at all. Food already gets too much attention IMHO (in my humble opinion), even though managing this disease involves a whole lot more than simply managing our diets. My blog's focus is primarily on the industry (business) of diabetes -- which on a worldwide basis is hundreds of BILLIONS of dollars, relevant events in the public/government sector, and cure-related news -- all areas that I think don't get nearly enough coverage. But when I learned of D-Feast Friday, I figured I could bend my rule for this particular occasion! Food is often very personal which is why I think there's so much variety. I personally find many (OK, a majority) "diabetes" recipes and suggestions just plain nasty and flavorless, using gross combinations of bland and flavorless ingredients (often fish, and there are so few fish recipes I even can stomach anyway - I know it's supposed to be good for us - and I'm extremely picky when it comes to seafood, so I avoid most fish recipes like the plague). Most of the time, I think fish "recipes" are just plain gross, and the smell is downright sickening, no matter what they try to do to it. But I have also learned to cook over the years (my waistline proves that much, though I know it's because I haven't been to the gym regularly, and my energy expenditure -- at least the physical but definitely not the mental -- part of the balancing act is deficient). While I'm not exactly a chef, I can certainly hold my own on dishes I've mastered, so I'll provide a few here, and we're not talking about barbequeing in the back yard here (I live in NYC, so I don't even have a grill, or a back yard for that matter! ), and I definitely can tell what I like and don't like, and my tastes are definitely global in nature. First, this acronym isn't mine. I borrowed it from Scott K. Johnson (see here) who apparently borrowed it from CDE Gary Scheiner, who I mention later in this post, but because it's applicable to so much of diabetes manaement, ranging from insulin to knowledge, to food, I'm using the metaphor here. For me, the key to any good dish is using quality ingredients, preferably fresh and as close to the source (of the foods) as possible. I try to buy organic and non-GMO whenever possible because I do not believe in genetically-modified crops (known by the unflattering term "frankenfood" by many). But given an choice between non-organic yet locally grown, I'd probably go with locally-grown because it's always fresher (sometimes you might even get to speak with the farmer), and has the added benefit of being "greener" by virtue of the fact that it requires significantly less energy for delivery than crops transported from halfway across the planet. Practically speaking, that usually means fresh vegetables, and using as few processed foods as possible -- meaning pre-packaged, high in white flour (or any flour), sugar or it's evil twin high-fructose corn syrup, sodium, etc. You have to make the stuff yourself, so even if it's the junkiest food anywhere -- think of things like potato chips or tortilla chips -- widely considered to be junk foods, but they're still always better for you when you make them from scratch, as my Mom would say, because you can control what goes into them and skip the ingredients you can't even pronounce. Remind me again what xanthan gum is? I try to follow recipes closely, but I've been known to deviate from them when it makes sense. For example, if I like most of the ingredients in a recipe except for a particular one, I'll "86" the ingredient I don't like, and maybe replace it with something I DO like. I also tend to be a bit more liberal with some of the spices because I'm a bit of a spice whore -- not by a lot -- but for example, I've been known to add more garlic, salt & pepper more generously than an ingredient list specifies. But I do try to stick as close as possible to the original quantities in the recipe so that others don't complain that something I've made is too spicy, too salty, too peppery or too much of something else. So I'm going to break my first rule already and make a fish "recipe" (actually two!) -- well, sort of! Canned tuna has a bad reputation. It's sometimes depicted as a mercury-laden fish product that was a staple of school lunches when we were kids, but having no place in gourmet anything. But that's because of how it is routinely served and used. It's usually laden with mayonnaise, or else in some kind of unglamorous casserole, which by definition, are usually calorie-dense dishes with lots of noodles, cheese or creamy canned soups, maybe topped with breadcrumbs. Canned tuna is viewed (unfairly) as having no place in gourmet anything. I actually love canned tuna (Bumble Bee Lemon Pepper tuna is great in a salad), and my goal is to prove this wrong for both an appetizer and a main entree. This first one is for a hors d'ouvre. I don't recommend the pâté with the tuna entree, but I'm providing recipes for three courses which you can use whenever. The good news is these dishes are easy, tasty and the ingredients aren't hard to attain -- and better still, most are pretty inexpensive! The first recipe is for tuna pâté as an appetizer, which I recommend be served with crudité (which is basically sliced or whole raw veggies; celery - which is my personal favorite - carrots and grape or cherry tomatoes are widely available already-prepared, but you can also add or subsitute sliced cucumbers, broccoli and/or cauliflower florets, julienned peppers, etc. in whatever combination you like), or if you like, crackers or breadsticks (crudité is the carb-friendly option). Pâté is usally very fattening made from abbatoir animal livers. Health food? The French may disagree, but probably not. But it does add taste and substance to your hors d'ouvres, and this one is a significantly lower-calorie and fat version. There are "mock" versions of tuna pâté that are strictly vegan, but this is enough of a stretch from liver pâté, so I won't push the envelope quite that far. Now, truth be told, I actually got this recipe from an author named Mollie Fitzgerald, a Duke University student (at the time) who wrote a dormitory cookbook called "On Campus Cookbook" back in 1984. The recipes were designed to use ingredients that you could store in a dorm room, or be easily attained on-campus and prepared with common appliances (fridge, microwave, hotpot, blender, etc.) that are likely to be found in some dorm rooms. It's the only recipe from this cookbook I still use, but I think this one is a keeper, thus the reason for my including it here. 1. Place the tuna and the yogurt in the blender and process until smooth. Add the other ingredients until well combined. Now, here's where I'm going to make a recommendation that Ms. Fitzgerald did not, likely because I doubt many college kids keep food processors (or even the miniature version, such as a Black & Decker Mini-Chopper which is an awesome tool, by the way!) in their dorm rooms -- even blenders may be scarce except for those who really like margaritas! But I highly recommend using a food processor (or it's minitaure version, a chopper of the sort noted above) over a blender because I think the blender pulverizes the ingredients and makes them too liquid-y for my personal preference. A food processor/mini-chopper will address that issue perfectly. 2. Taste and correct the seasoning. Transfer to a bowl for serving. If you have a refrigerator (and I think most of you will! ), cover and chill for an hour - the flavor will improve. Next, I will start with a first course of soup. This is a recipe that I make occasionally, usually during the fall and winter, but its great anytime. I love soups of all types except for cream of anything -- I'm not fond of dairy products in my soups, and those soups also tend to be very high in calories (think of the calories in New England clam chowder relative to Manhattan Clam Chowder and you get the basic idea). Generally, all soups are filling, often low-calorie and can be quite low-carb as well, making them ideal food choices for PWDs. Believe it or not, I made this next recipe up for myself, although truthfully, I tried to copy or at least imitate the same item on the menu of Bertucci's (a Massachusetts-based Italian restaurant chain that has locations throughout 10 states in the Northeast). You'll note that my version differs from some of other versions of this recipe you might find online in a few important ways. "A cup of rice has more carbs than a cup of pasta [such as noodles that frequently go in soups]. In fact, there is about 50 grams of carb in a cup of instant rice, and 30-40 grams in a cup of pasta. Rice prepared at most Asian restaurants is even higher - as much as 75 grams per cup, because the starch that the rice sheds as it cooks is not rinsed off." Rice is a relatively minor ingredient in this recipe, and I don't think you should try to remove it from the recipe because it just wouldn't taste right without it. But I do have a way of reducing some the carb content for this particular ingredient, which for me, is actually much higher on the glycemic index than white bread. A fair number of popular soup recipes that have rice as an ingredient (I'm thinking of chicken and rice soup, for example) call for you put UNcooked rice into the soup and let the rice cook into the broth itself. That's a big mistake for this one. Acknowledging Gary's note above, I knowingly choose to use a smaller amount of rice in this recipe, and perhaps more importantly, I recommend that you PRE-cook and also rinse the pre-cooked rice before adding it to this soup. This enables you to reduce quite a bit of the unnecessary starch that would otherwise go into the soup base. Also, it ensures thia soup will not become thick and gelatinous, which is not the character for this soup. Soups calling for rice generally do better with long-grain rice varieties; short-grain rices or something like italian risotto won't work. My preference is for Jasmine rice but any long-grain variety of white rice will work. Just avoid instant and boil-in-the-bag varieties. Note that rice will continue to absorb the soup broth, which can break as the soup cooks down -- that's fine, the important thing is the taste and texture it imparts along with the other ingredients. Some people sing the praises of brown rice, but brown rice won't work in this recipe because it takes longer to cook, and the nutty flavor of brown rice just doesn't work well at all with the other ingredients. Now, let me say that sausage of any type is anything but low-calorie, and may be higher than recommended in terms of saturated fats -- there no news there. But realize that in this recipe, the sausage, while a vital ingredient for the flavor, is not the bulk of what will actually end up in your soup bowl, which is mostly broth and spinach. The key here is the fennel-flavored and seasoned sweet italian sausage adds a truly unique flavor to this soup, one that cannot be replicated with some alternative ingredient, so unless it's sweet italian turkey or chicken sausage (I've never tried using sweet italian turkey or chicken sausage for this, so I can't really comment on whether the flavor is similar enough), don't try and get too creative on alternatives on this particular ingredient, because I think you'll loose the very essence of the recipe. Sweet italian sausage is widely available across most U.S. supermarkets. Typically, this is pork and/or beef, but I have also seen lower-fat turkey and chicken varieties -- I seldom use that, so I can't really comment on their flavor in this recipe. For those who TRY to follow Kosher or Halal dietary guidelines (loosely anyway, although I don't think any sausage qualifies), this would be a necessity. As noted, it is the unique seasoning that makes sweet italian sausage special -- a combination of fennel and other spices -- so don't use another type of italian sausage, because the flavor just won't be the same. You may need to buy this ingredient as sweet italian sausage links (usually about 6 links) and remove the casing before pre-cooking the sausage meat. This is a hassle, but is a worthwhile step, because it just doesn't brown the same way if you cook it with the casing still on. Sometimes, you can also get sweet italian sausage patties and you would use about a comparable number of those, the patties are much easier to work with but aren't always available. Because all sausage tends to be greasy and a bit messy to work with, I tend to buy this particular ingredient in bulk at Costco or BJ's, cook it all at once, and then freeze it, pre-cooked and then use it as the need arrives. You can even add the precooked, frozen sausage to the heated soup base -- it doesn't necessarily need to be thawed before adding it because it will just cook in with the other ingredients anyway. This way, you can prepare this ingredient long before you plan to use it! 8 cups beef broth or beef stock, or a comparable amount of beef soup-base mix (sold in some supermarkets or warehouse club stores) and water (although home-made beef stock would really be soooooo much better, because I seldom cook any type of beef myself, I don't usually make beef broth or stock myself; just note that the sodium levels in pre-made stocks or soup-bases is very high, so if you have hypertension issues, you may need to choose a lower-sodium variety which can be more difficult (and expensive) to find, but home-made is preferrable anyway -- but I'll have to refer you to another source for instructions on how to make it. 1 (28 ounce) canned diced tomatoes (plain or with Italian herbs, your choice). You can, if you wish, use finely-diced canned tomatoes instead. 1 package Ready-Pack fresh, baby spinach (you can add slighly more if wanted; this ingredient adds an incredible, irreplacable flavor to the soup base and cannot be skipped, but just be sure to let it cook down before adding more). I use Ready-Pack fresh, baby spinach (found in the produce aisle of most supermarkets), but you can get away with using regular fresh spinach (avoid canned or frozen spinach). Personally, but I don't care for the thick stems of regular spinach and I think they're bitter, so baby spinach let's you avoid both with ease. 1-2 medium onions (yellow or white, just don't use sweet Vidalia onions), chopped. Now, I have also tried it with thinly sliced onions, which adds a very nice texture to the soup. But you'll get slightly more flavor from chopped onions, but either works -- the flavor is why this is ingredient is included in the recipe. If you're lazy, you can buy frozen, chopped onions and just add about a half a bag to the soup base. 1. Note that the soup broth/stock/base should be the starting point, so put it into a large stock pot and add the can of diced tomatoes (juice included) -- just dump the whole can in (this part is the most fun!). 2. Next add the pre-cooked sweet italian sausage meat. Bring to a boil (not a simmer) and add the uncooked, diced (or sliced) onions. While this is cooking, add the fresh spinach 1-2 handfuls at a time. Let the spinach cook down a bit before adding more, and just keep adding until you've added the entire package. 3. Once the spinach is cooked down, reduce the heat and simmer for about 2 hours. This recipe's flavor develops with the ingredients cooking together, so the longer it cooks together, the better the flavor will be. You may add pepper, salt and Worcestershire sauce at your discretion. Like many soups, the flavor develops over time, so the longer this sits with the combined ingredients, the better the flavors will meld together, but I consider 2 hours a minimum for proper flavor. 4. The final ingredient to add is the rice. I do this shortly before serving because the cooked rice kernels continue to absorb the soup broth, and will break apart and reduce the amount of broth in the soup. Final thoughts: If you have any leftover soup, you may refrigerate and reheat it, just note that the rice may require that you add some additional water (try adding a cup at a time; if you add more than 3 cups, you should also add a beef boullion cube with it to maintain the flavor; pepper, salt and Worcestershire sauce can also be added at your discretion). I also do NOT include any cheese of any sort in the recipe, although I've seen recipes online that call for this ingredient. For me, this ingredient adds unnecessary calories to the recipe without adding anything to the flavor, so I recommend just skipping it -- why mess with something that already works? Some of you are already saying "what the hell is pasta doing in a diabetes-friendly recipe? 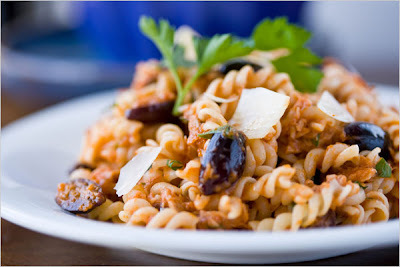 Well, believe it or not, sometimes pasta is a PART of a dish, not necessarily the entire base. For me, the key to success is using a high-fiber pasta, and there are 2 brands that you can look to for this ingredient. Dreamfields or Fiberwise pasta, which has a much higher-than-normal portion of fiber, which can be subtracted (if greater than 4 grams per serving) from the total carb count is really the only option for this ingredient. Finally, let me note that the creator (or reporter) of this New York Times' "Recipe for Health" prefers to use fusilli as the pasta of choice, because she says she likes the way the tuna gets lodged in the twists of the corkscrews. I've never found that to be true, but she notes that other types of pasta, such as penne or spaghetti, work just as well. My personal preference is penne because it is less carb-dense than other varieties mainly because it's hollow tubes of pasta and takes up more room on your plate than a comparable amount of spaghetti, making it look like more food. If you want to make a complete meal of this -- and I usually do -- the creator recommends adding a green vegetable to the mix. I usually do a side salad, but fresh string (a.k.a. green) beans (since it's summer) are another awesome choice! 3/4 pound fusilli, penne, farfalle or spaghetti (I prefer using Dreamfields or Fiberwise pasta which I noted above, which are much higher in fiber than regular pasta and really don't wreak havoc on my blood glucose levels). This is really a MUST for this recipe, so don't go cheap and buy the store brand for this ingredient. 1. Begin heating a large pot of water for the pasta. In a large pasta bowl, break up the tuna. Heat the olive oil in a small frying pan or saucepan over medium heat, and add the garlic. Cook, stirring, just until fragrant, and remove from the heat. Add to the tuna. Add the parsley or basil, and mix together. 2. Add the tomato sauce to the pan, heat through, and then add the red pepper flakes if using. Stir in the olives. 3. When the water for the pasta comes to a boil, add a generous tablespoon of salt and the pasta. Cook al dente, until firm to the bite, following the cooking instructions on the package but checking the pasta a minute or two before the indicated time. Remove two tablespoons of the cooking water, and mix with the tuna. 4. When the pasta is al dente, drain well and transfer to the bowl with the tuna. Add the tomato sauce with the olives, toss everything together, and serve. Pass the Parmesan at the table. Advance preparation: The recipe can be prepared through step 2 several hours ahead of cooking and serving the pasta. Fresh tomato sauce will keep for three or four days in the refrigerator, and it freezes well. Glad you decided to participate (and with fish, even) because your recipes look so good! I make something similar to the tuna pate, need to look into putting some spice in there. I'm so glad you caved to the D-OC peer pressure and did a food post. And can you believe, as picky as I am, I would absolutely (and will, soon) eat all three recipes - except for the olives in the pasta, which I might replace with marinated artichokes when I make it. Yum!! First time caller here. Rockstar recipes all-around. I'm looking forward to donning my chef's toque and trying these out this week. I found your blog very interesting, and helpful for people with diabetes. I am trying to be helpful as well as I see how people have no conscience about this condition, still people who live for years with diabetes. I have created a blog to help people with diabetes by sharing their own experiences, and also trying to be updated about latest diabetes news and researches about this disease. I would like to add links in my blog from other people like you who are DOING SOMETHING TO HELP, also in different languages so people from different countries can reach all the possible good information. I think that unity creates strength and this is extremely important to help other people have conscience about the importance of a good treatment, care, exercise, and healthy foods with a carbo's therapy if possible. I would like to have permission to link your blog into mine and also if you think my blog can help other people you can link it in yours. I simply CANNOT do pastas. I'm glad you can, but even dreamfields sends my sugars FLYING. I swear the "sugar alcohol" content does nothing for me. My body sees it as just plain sugar, and that is that. Fiber does make a difference. One of the MANY things I hate about this disease is how one thing works for some people, and not for others. I love Lantus. I can see you don't. I can't do pasta. You can. How I wish things were STANDARD. But they're not, and my wishing won't make it so. The soup looks amazing, I will have to try it.